Photograph of Claudio Reyna. No date. With five national championships to its credit, the men's soccer program has been the most successful athletic program at the University of Virginia. Joining the Virginia coaching staff in 1978, Bruce Arena, the current coach of the U.S. National Team, recruited such exciting players as John Harkes and Tony Meola from his home state of New Jersey. 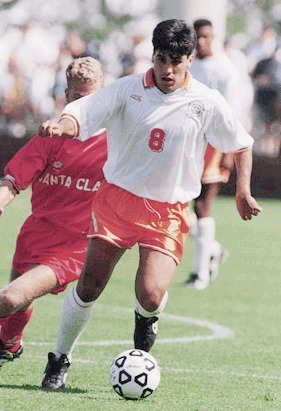 Harkes became Virginia's first national player of the year, and Meola led the team to its first national championship in 1989. Both later starred in the 1990 and 1994 World Cups. In 1991, a midfielder arrived from Springfield, New Jersey, who eclipsed all his predecessors at Virginia in talent and winning edge. Claudio Reyna made an immediate impact, leading the Cavs to national championships in each of his three seasons. A three-time, first-team all-American, Reyna garnered national player-of-the-year honors in 1992 and 1993. Reyna left early to play in the World Cup and now plays for the Glasgow Rangers in Scotland.